Under certain circumstances, the Xbox OneGuide on the Xbox One console may not display your channel lineup, may show incorrect information, or may not show any information at all. This is generally due to either incorrect settings or a delay in receiving information from Xbox Live. Important The accuracy of the channel lineup information depends on the public channel lineup databases shared by cable channel providers. There may be a delay between the updating of these databases and changes to your local channel lineup. 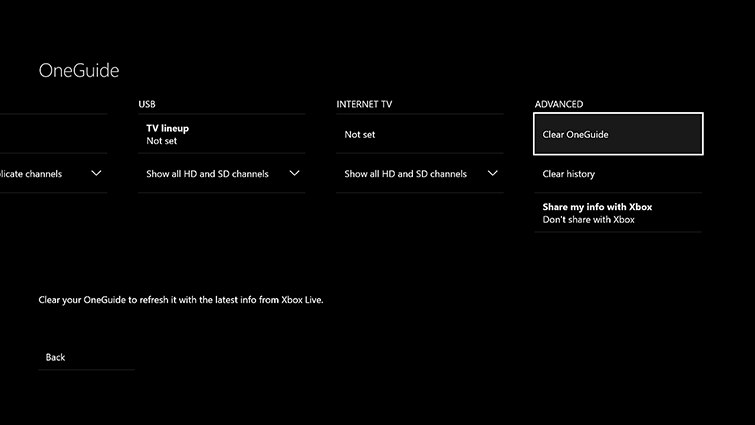 Connect to Xbox Live to view your channel information in the OneGuide. You can’t see your channel information when you’re offline. Note Double-tapping the Xbox button opens the guide from any other screen on the console. Review the OneGuide details (such as your postal code, provider, and lineup) to make sure your TV lineup is correct. 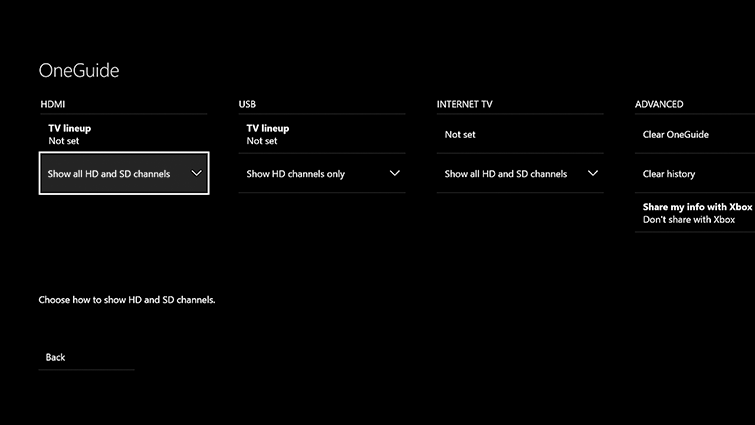 For more information, see Set up live TV with your Xbox One. 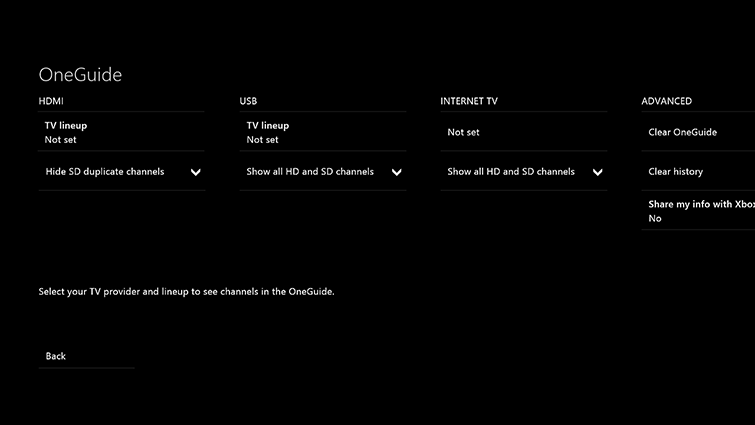 Select Show all HD and SD channels to ensure that all channels are present in the OneGuide. For more information, see Personalize OneGuide on Xbox One. You can now report OneGuide problems right from your Xbox One console. 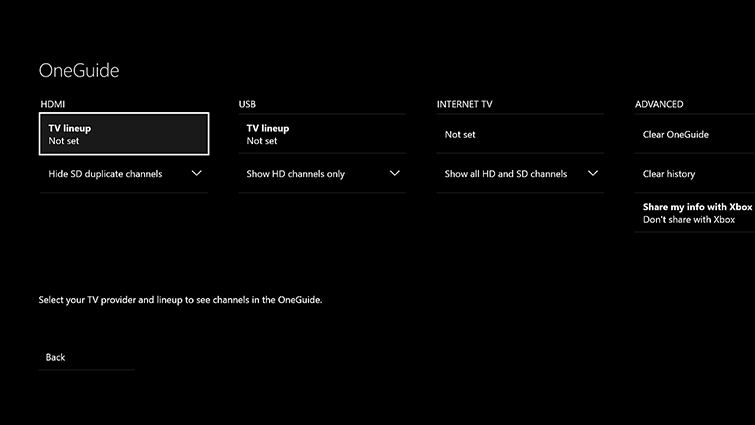 For more information, see How to use the OneGuide issue reporter on your Xbox One console. Would you like to contact Support regarding the "Channel list or show information is incorrect or missing from the OneGuide" issue you were reading about or a different issue?